Phantom looks awesome. Glad he is doing well and settling down for you. 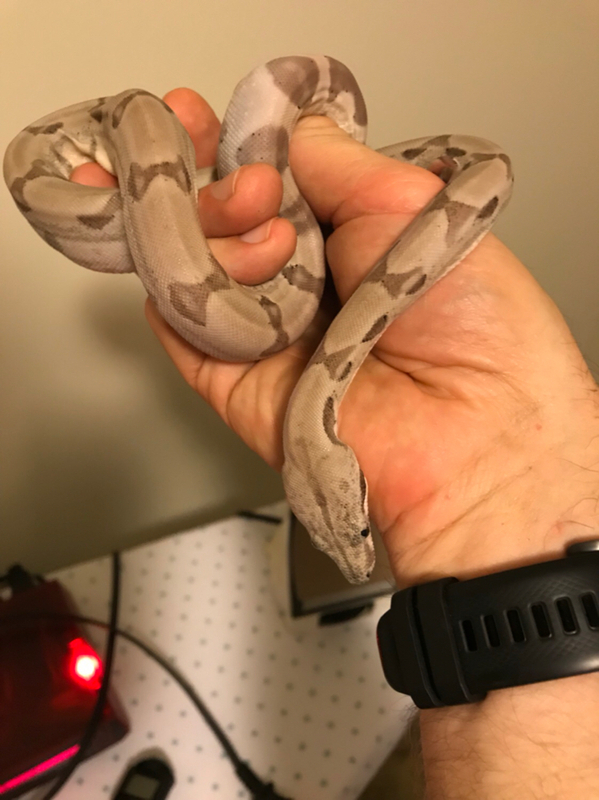 I think he's going to be an awesome and docile guy for you. You just needed to give him some time and not overwhelm him. If he's still chill for another few weeks, you can probably go to holding him 3-4X a week instead of 2-3X. You can also try holding him for up to 15 minutes instead of 10, etc. I think you know how to read him now and he's demonstrated he appreciates the respect and care. Keep up the good work. By the way, if you think he's strong now, just wait! Thanks fellas for the kind comments! It'll be interesting to see if he reverts back to his normal aggressive feeding response instead of the passive approach he took last week. Feeding response can change depending on a variety of factors. I wouldn't sweat it. A few times when younger, Behira had me put the rat down and then ate it anyway. These days, I can't have it in there for more than 5 seconds without it getting nailed. However, I am now feeding every three weeks, not every 1 and then 2 weeks. Keep up the good work. Love his look; so clean! Phantom looks awesome CK. 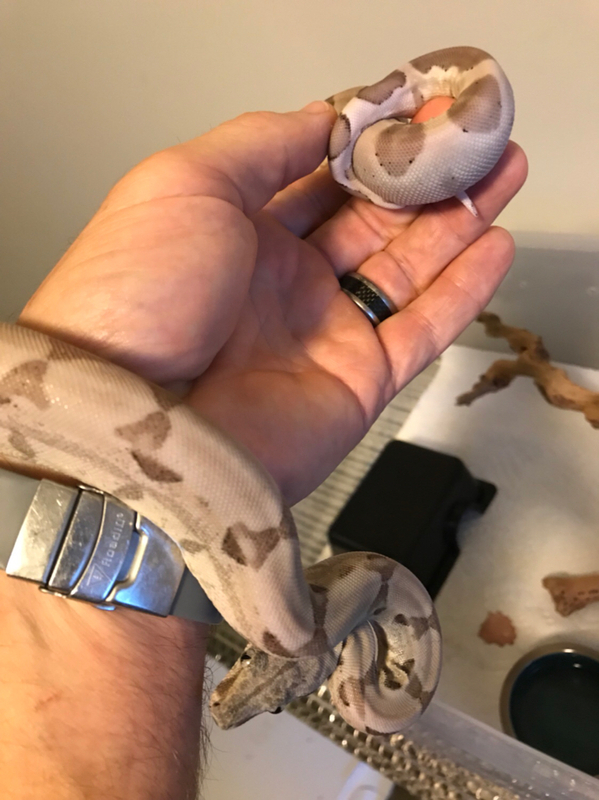 I can't wait for my boas to start getting some size on them. Here’s some pictures of the new paint job. I think he looks so fresh and so clean! Sounds like your humidity is dead on. He is one smooth operator! Lookin good in the new suit! Gosh what a looker! Thanks for sharing! 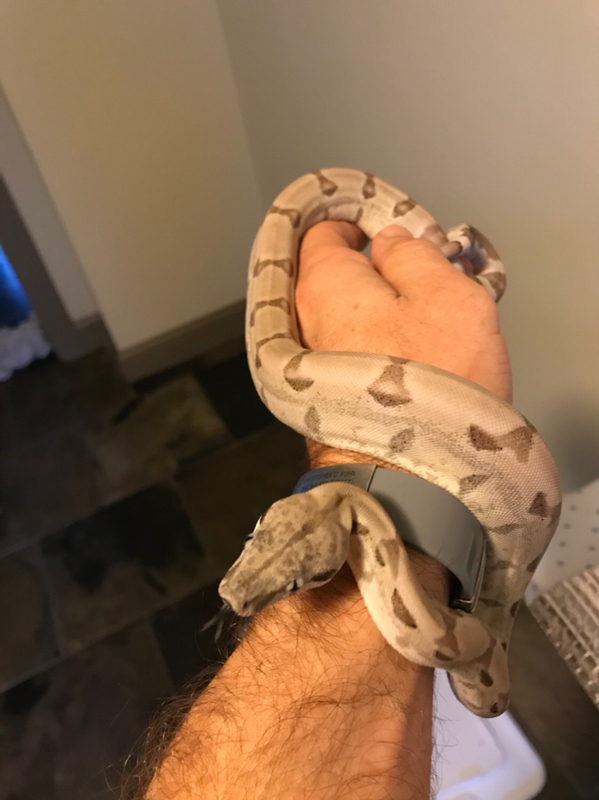 It’s fairly common for a shedding snake to refuse food, and you can see the blue eyes in the photo. If they do take, their striking behavior is much reduced. 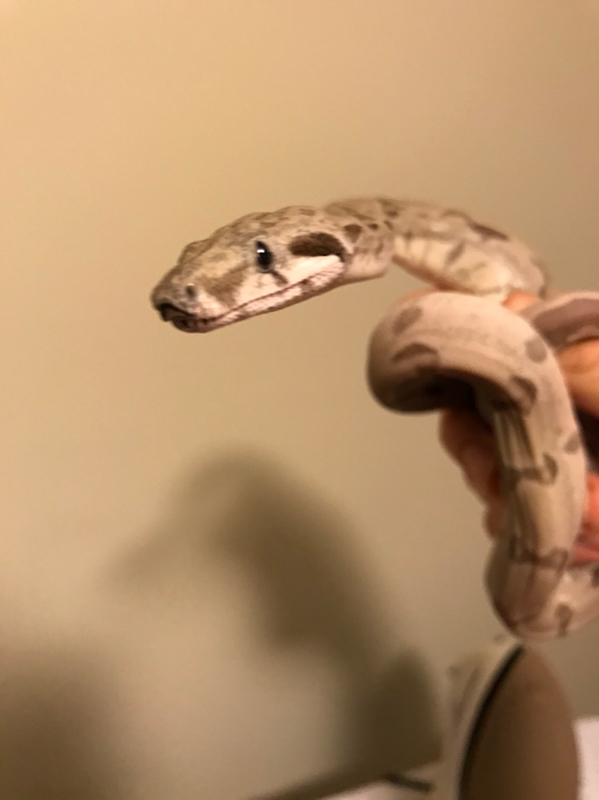 I’ve noticed most boas’ eyes don’t go completely blue like other snakes. 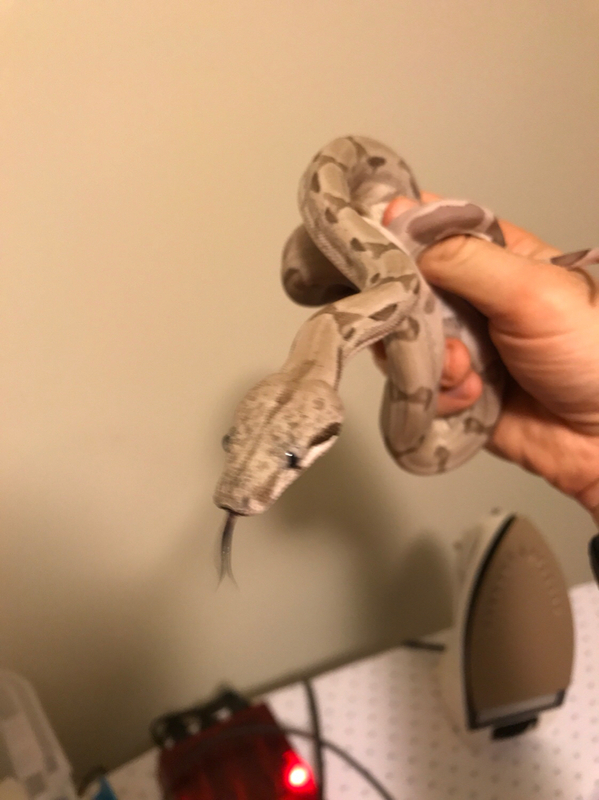 I have some photos on my laptop of my boas in deep blue, and their eye coloring is still very apparent even at the height of milkines. 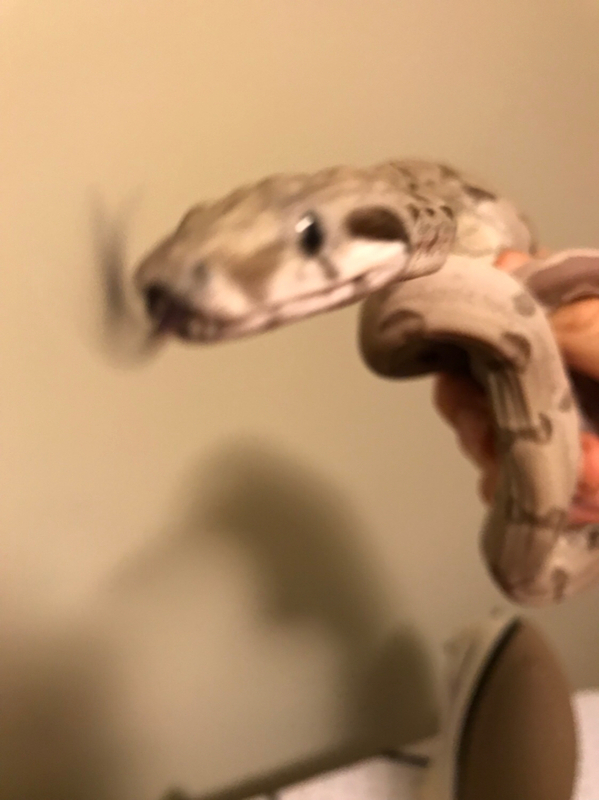 The nose bumping is pretty normal behavior for most snakes. If you’re talking about them almost dragging their head across, bumping their nose up along the way? It’s way for them to feel for a place to grip, and when they do they will squeeeeze, or flop around if they still feel they are falling. I generally just guide my hand to their head and roll it into their coils as they come to wrap around. 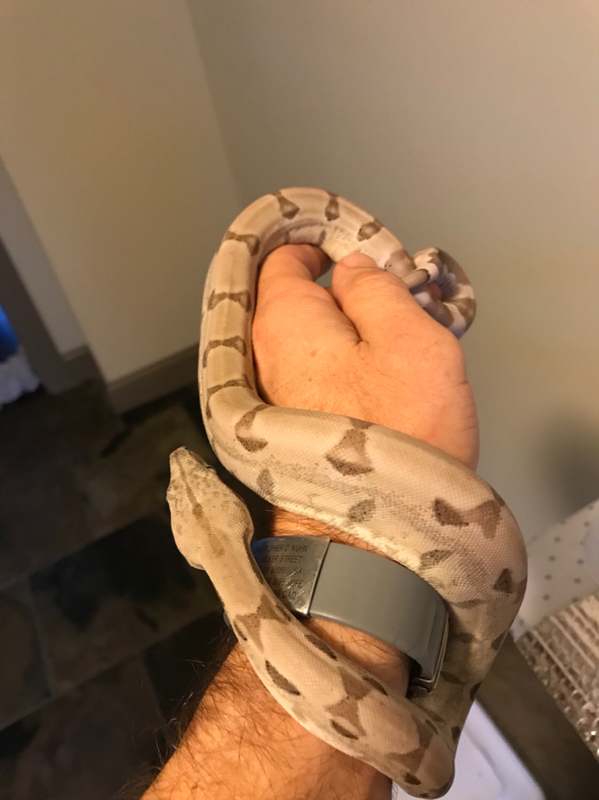 If they’re especially nervous, they’ll bite as soon as they feel you touch them, but usually this calms them right down. He’s looking good as ever! Things are still going well with Phantom. 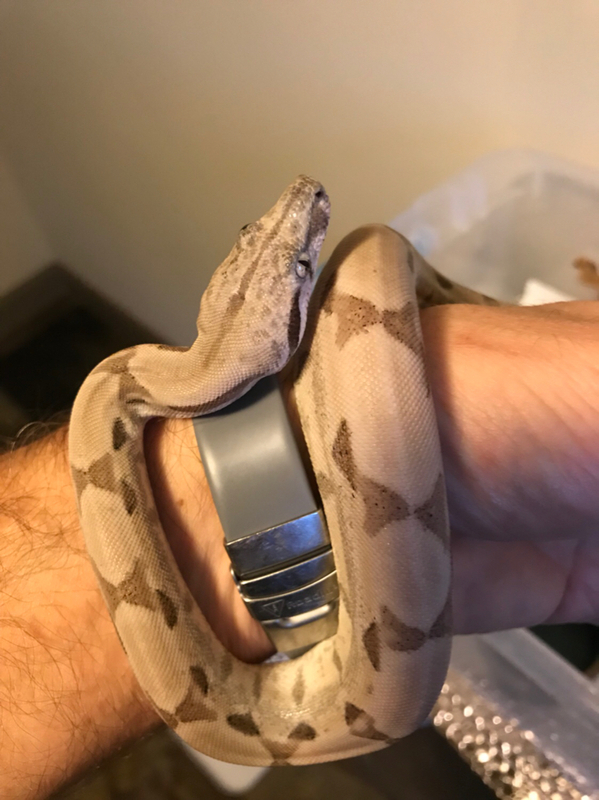 We had one of the best handling sessions where he was super chill and spent several minutes motionless wrapped around my hand. I still have yet to place him down on a surface and let him roam free. 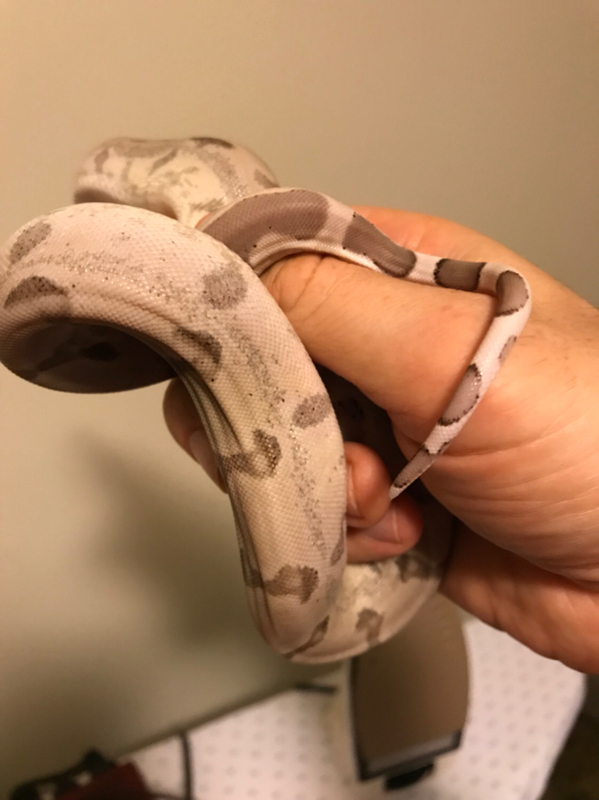 As you can see from one of the pictures below, he has a good anchor going with the tip of his tail. Also, the end of quarantine is fast approaching. I think it’s around two more weeks until the 90 day quarantine ends which is a good thing since it’s getting chilly here. I’ll be moving him to a heated basement where my BP is. 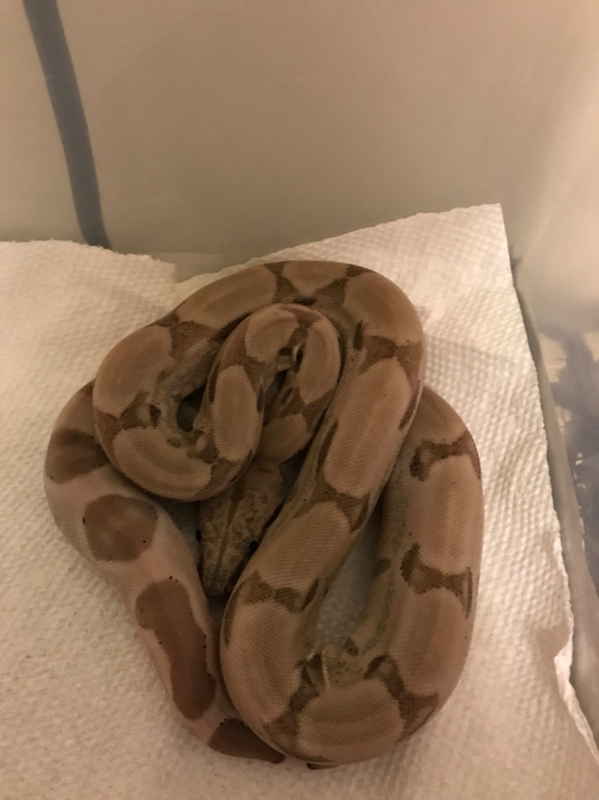 I’m still not sure when I’ll move him from his quarantine tub to his forever home which is an AP10 heated with an RHP. Any suggestions would be greatly appreciated.